Make a simple syrup by heating the sugar with the water in a saucepan (or microwave) until the sugar is fully dissolved. Allow it to cool, no need to refrigerate. Place the raspberries in the bowl of a food processor and process until very smooth, stopping to scrape the sides of the bowl once or twice. Pour the puree through a fine-mesh strainer and strain the mixture, pressing down and scraping the inside of the strainer with a silicone spatula. You will need a little more than 2 cups of smooth puree. If you don’t have enough, you can use blueberries to bring the volume up. Whisk the simple syrup and the lemon juice into the raspberry purée. Cover and refrigerate until cold, at least 3 hours. Pour the mixture in your ice cream maker and process it according to the instructions of your machine. 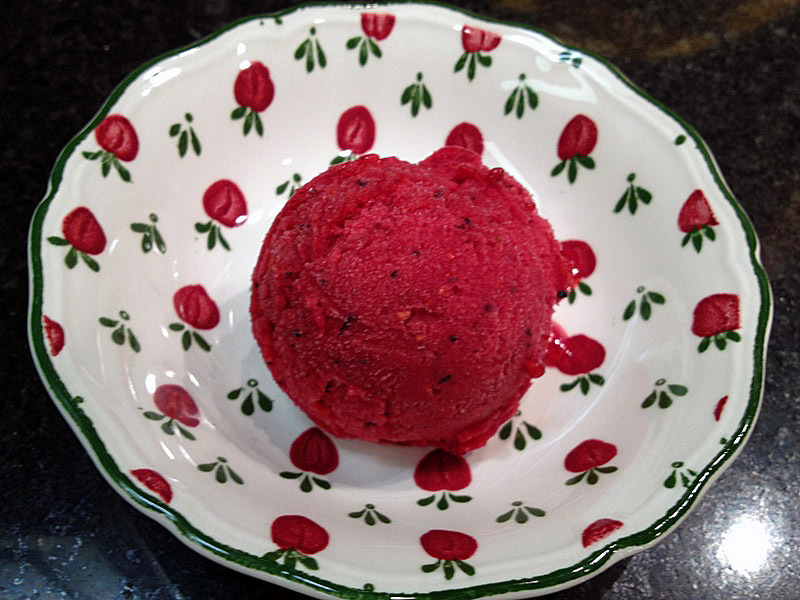 Once the sorbet is ready, place it in a container and freeze for a few hours before serving. « MOM TURNS 89 TODAY! What great luck. Beautiful recipe too. Great color to your sorbet and a great tip about using blueberries to increase the volume of the purée.I’ve always got blueberries in my freezer but raspberries tend to disappear, seemingly within hours of being purchased. I actually lost quite a bit of pulp due to my clumsiness dealing with three strainers and raspberry juice squirting around the kitchen and one particular dog. Refreshing sorbet! Unfortunately, in my house, raspberry is always get eaten first before I have a chance to turn it into any dessert. Yes, Sally, you are so lucky!! Love that you used minimal ingredients to bring out the pure berry flavors!! Gorgeous in presentation! I also like the simplicity of it, although I was wondering afterwards if a little alcohol of some type could complement it. Not sure, though. Oi Sally, a cor está linda e o sabor deve ser maravilhoso.Amei.Beijos e uma ótima semana. Obrigada, Vanderleia! Uma excelente semana para voce tambem! Although I can’t bear to think of summer’s end, I do think this is a gorgeous excuse to celebrate! Love this lemony berry sorbet… such a pretty colour too Sally! The flecks of blueberry amidst the raspberry look fabulous. You and me both. I am so glad the warm weather is still here… I know it will come to an end, and I’ll turn into a bitter person, particularly early in the morning when I need to put the dogs out in temperatures below 75F. The humanity! i am so sad I didn’t make sorbet before the summer ends- but thanks to southern weather- its still blazin hot here so I still have time! Go for it! Phil was asking me when I’ll be making another batch, but I need some time to recover from the sieving… not for sissies. and get this: at the entrance of the building, someone (I suspect it’s our colleague) left a HUGE, and I mean HUGE box of special small apples with the note: these are the best apples for apple pie. There will be more. I might just have to make an apple pie in the near future, right? Lucky indeed! The sorbet looks gorgeous (and tastes gorgeous, too, I am sure). So, which strainer finally worked the best? I should probably take a picture of it and add to this post. Maybe I will do it this weekend… 🙂 Anyway, the only strainer that worked had a slightly more open grid than the other two. One was a chinoise type, big, big mistake. Nothing goes through it, the seeds block the openings and it will take a long time to clean it. Never ever do that! 😉 THe other was not as tight as a chinoise, but still too small. You will need a strainer that almost seems too big to do the job. yeap, a picture would be great, will do so and edit the post. Stay tuned.